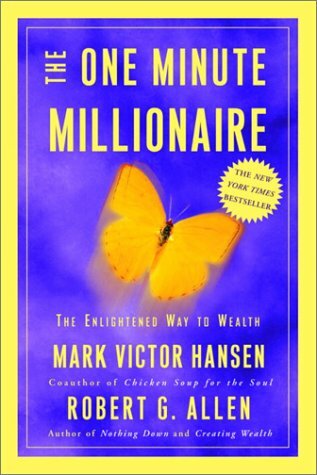 This mega-selling twosome (Hansen's name is on every book in the Chicken Soup series and Allen wrote the bestselling real estate guide No Money Down) offers a long-winded pep talk on how just about anybody can make big money. According to the authors, "At this very instant you are standing in the middle of millions." They maintain that anyone can achieve "enlightened" wealth, a utopia where everyone has money and tithes, creating a better world for all. Hansen and Allen's approach is a mix of self-help and money talk, though a bit heavier on the former. The left-hand pages are a simplified explanation of how to amass millions, with options such as write a book, buy and sell real estate and start a company. The right-hand pages illustrate the same themes, via fictionalized dramas, e.g., newly widowed Michelle's struggle to come up with $1 million in cash to get her two children back from her in-laws. Hansen and Allen's feel-good suggestions run along the lines of "find a mentor," "use a fulcrum" and "be part of a team." Full of endless acronyms (e.g., "System: Save Your Self Time Energy Money"), catchy phrases (e.g., "A Dream + A Team + A Theme = Millionaire Streams") and animal imagery (butterflies, honeybees, owls and hares scamper among the pages), this offering echoes much of the self-help cacophony already out there. But its message is muddled: sometimes the millions are yours for the asking, and sometimes it's the system that keeps you down.